SpreadEx offers the LG 575 mid-size granular spreader. Designed specifically for sports turf, grounds maintenance, landscaping and golf course management applications, the LG 575 is ideal for spreading seed, fertilizer and control products. Standard with variable-speed controller, the spreader's material flow gate calibrates and controls material flow. Designed to work with multiple service vehicles, the LG 575 spreader comes standard with a 2-inch receiver hitch mount. Built with low-maintenance, direct-drive system and moving parts, the LG 575 offers trouble-free operation. With no belts, pulleys or chains, downtime is limited. Mounted in a weather-tight enclosure, the 12-volt DC direct-drive system includes a revolutionary maximum-torque transmission. AerWay produces a complete line of Advanced Aeration Equipment for use by all sportsfield managers. Units start at 45 inches and go up to 15 feet. All AerWays can use one of four tine systems including the Sportstine, the Shattertine, the Finetine and the Coring Tine. Ask about the specially designed Turf Harrow as well. AerWays start at $3,810 and are used across the country by sports teams, colleges, high schools and municipal governments. AerWay allows you to aerate and play with no delay. Broyhill's AccuAire® core aerator is one of the most powerful aerators on the market, able to penetrate the toughest terrain. The FlexWingTM design allows the AccuAire® to follow the contour of the ground, providing even penetration. Solid-steel frame and extra-wide racks add weight to maximize core depth. Two styles available: 3 point and tailored. Equipped to use slicer blades or core spoons, the AccuAire® is available in two lengths: 69 inches or 93 inches. The trailered AccuAire® is equipped with a hydraulic lift and hooks up easily to the Broyhill TerraForce® and LegacyPRO®, or other utility vehicles equipped with hydraulics. Cherrington lifts the soil onto a reciprocating power screen. Objects larger than the screen size are retained and carried by the loading flights to the hopper, while the Screened-Clean sand or soil falls back to the ground. Functions like a stationary screener, but on a tractor-towed or self-propelled, self-loading mobile screening frame. Screens can be quickly and easily changed to meet different job specs. Nothing can escape or slip through the powered screen. All soil is Screened Clean and returned to the ground for a perfect seedbed for landscaping, trench restoration, soil remediation, horse tracks and arenas, or beach cleaning. Hustler Turf Equipment announces that the BAC-VACTM catcher now fits all the new XR-7TM mowing decks. Features a 9-bushel fiberglass hopper that won't corrode or rust. The operator can dump from the seat, and does not have to leave the machine. Features easy-on, easy-off for both blower and hopper. Flow-through ventilation system keeps dust and debris off the operator. Fits older models and the new XR-7 mowing decks in 54-inch, 60-inch, 66-inch and 72-inch cutting widths. Gandy offers core and knife aerators from 4 to 8 feet wide in tow and 3-point hitch models. The 4-foot models have a central shaft featuring separate dual-wheel coring heads with six cores each. The Gandy 6- and 8-foot professional models are ideal for athletic or playing field maintenance and feature 3-point hitch attachment for larger utility tractors. Both may be ordered with 3/4-inch coring spoons or with slicing knives. The design incorporates dual disks on independent arms that flex independently with the terrain. Weight tray is optional. The 6-foot model can also be converted to 8-foot width. 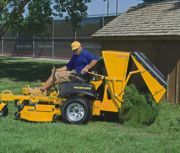 Earth & Turf LLC introduces its new MultiSpreadTM Model 320, a 1-cubic-yard top-dresser with exclusive, wide-spread beater for lawn-maintenance professionals, schools, universities, golf courses and athletic fields. Spreads top-dressing materials, infield mix and grass clippings. Two-wheel ground drive with 26x12.00-12 turf tires ensures easy pulling by 20-horsepower tractors. Another Earth & Turf "Simple, well-built" design. The Scag Turf Tiger devours the toughest mowing jobs. The new 25-horsepower Kubota diesel engine, along with a 61-inch Velocity Plus cutter deck, delivers excellent performance, torque and fuel efficiency. With 16cc hydraulic pumps and heavy-duty wheel motors, auxiliary oil coolers, double-tube-steel main frame and driveshaft-powered cutter deck, the Turf Tiger is unmatched. Ultra-low center of gravity and wide stance ensure traction and stability. Ground speeds up to 12 miles per hour result in maximum productivity. The exclusive "Command Comfort" operator's station provides an unprecedented level of customized comfort. 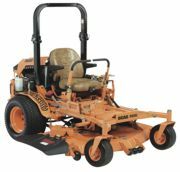 Features a two-year limited mower warranty with three-year limited cutter deck and spindle warranty.